I’m picky when it comes to crime novels. If there isn’t a delightful balance between character, believability and suspense, I’m apt to put the book down and forget about it. 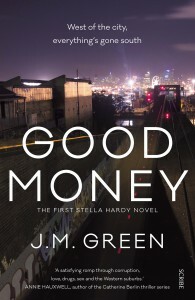 Thankfully, Good Money by J.M. Green balances all of these elements. Green is a debut author whose book was shortlisted for the Victorian Premier’s Literary Award for an Unpublished Manuscript in 2014. 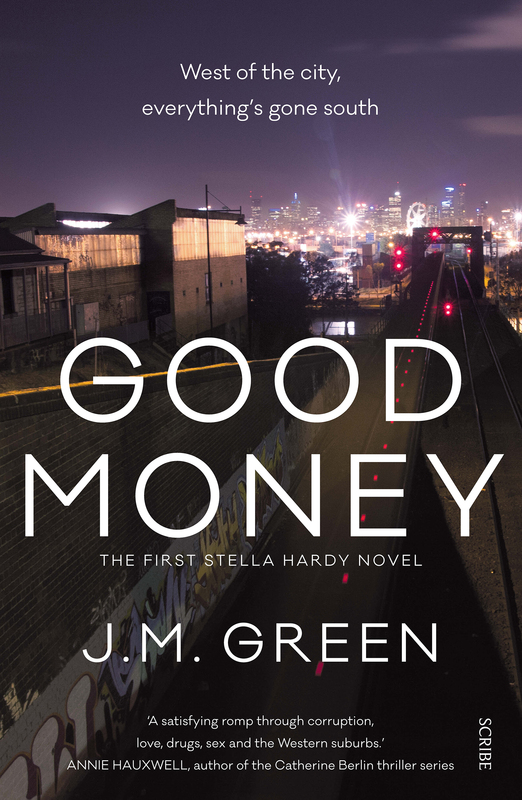 Good Money is a compelling story of drugs, shady criminals and murder in the Western suburbs of Melbourne. The book’s main character is Stella Hardy, who works as a social worker in Flemington. Isolated and lonely, Stella seems washed out by work and life in general: ‘My energy went into breathing, going to work, watching TV, then repeating…’ All this changes when the son of a client is found murdered, which is seemingly connected with her own buried secrets. After breaking into Tania’s apartment and discovering that she is actually the daughter of a mining billionaire, Stella enlists the help of her best friend, a police officer named Phuong. The two indulge in frequent bickering, with engaging wit and hilarious one-liners. Their friendship is exceptional, and a highlight of the book. Amid the murder and depravity, Stella also finds a love interest. Turmoil ensues as her lover, Brophy, battles with an ice addiction. The use of methamphetamine is highly relevant to the current epidemic in Australia, and is a notable inclusion. The book also enters into the business sphere, with an ongoing feud between the mining empires appearing to be reason for the mysterious cases. While revelations regarding the mysteries do seem rushed at times, Green still maintains tension through her enigmatic characters and captivating humour. It was refreshing to see two female leads in a crime fiction novel. Although it was cringe-worthy to read about Stella being frequently attacked for her appearance, as well as about Phuong encountering condescension and racism from her male coworkers, these were all valid experiences. The subtle portrayal of everyday sexism could not be more realistic. Green’s use of gender-neutral initials is also reflective of these issues in real life. With publications authored by women making up only 23% of reviews in the AFR, inequality continues to be a major problem in the publishing industry. Countless authors, including J.K Rowling and Harper Lee, use a neutral pen name to negate the effect of gender bias on book sales. Consistently, the number of women reviewers and reviewed female-authored books is disproportionately low. It is a shame that talented writers, such as J.M. Green, often feel they must hide their gender for equal treatment. Green captures experiences wholly and honestly. Her characters are complex, engaging and, most of all, real. You find yourself caring for them, laughing with them, and forgetting that this book is only paper-thin. The plot itself is clever and suspenseful, but it is the enigmatic and three-dimensional portrayals that make Good Money extra special. This entry was posted in Arts, Books and tagged book review, books, crime fiction, feminism, fiction, lip lit, literature, melbourne, writing. Bookmark the permalink.